Here you will find textbooks, podcasts, dictionaries, books, music, and more to support your Portuguese learning journey. Surround yourself with good resources and make this a fun ride! I am the proud co-author of a nice, little book of colloquial expressions! Brazilians make abundant use of idiomatic expressions both in social and professional situations. 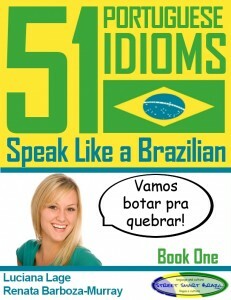 Learn 51 Brazilian Portuguese idioms in the context of 102 everyday situations. Learn 12 different uses of the magic word Mesmo in Portuguese in a fun and easy way. Follow our characters Ana and José as they use Mesmo in 58 real-life dialogues. I underlined especially interesting colloquial expressions, verbs, and vocabulary for you; the dialogue translations into English can be used to learn what these words mean. The entire book is bilingual; each dialogue is presented in Portuguese with its English translation right below it. Throughout the material I offer you pointers to video lessons, music, and blog posts so you can learn even more. My Street Smart tips will get you speaking like a Brazilian. I have an article with a review of my favorite textbooks to learn Portuguese, including highlights of each book. Click on the books below to learn more about them on Amazon.com. Check out my reviews here. These books are for intermediate and advanced speakers or Portuguese. Click on the books below to learn more about them on Amazon.com. Check out my reviews here. Our blog has a ton of lessons, flashcards, and cultural articles. Our YouTube channel has several Portuguese lessons for all levels of language skills. You can learn a lot with songs. The trick is to make it an active learning activity. What do I mean by that? Go and look up the lyrics, look up words that you don’t know, pay attention to the singer’s pronunciation and how they put words together, read the lyrics out loud, and, of course, sing along! In other words, pay attention to the song and interact with the lyrics. It will help with listening skills, pronunciation, vocabulary, and grammar. For great tips and strategies to learn language using music and other media resources, check out Susanna Zaraysky’s book Language is Music. It is available in English, Spanish, and Portuguese on Amazon.com. Disclaimer: Though we have used our best efforts in preparing this list, information is provided “as is” and we make no representations or warranties with respect to the accuracy, timeliness, reliability or completeness of the contents of the resources listed here.